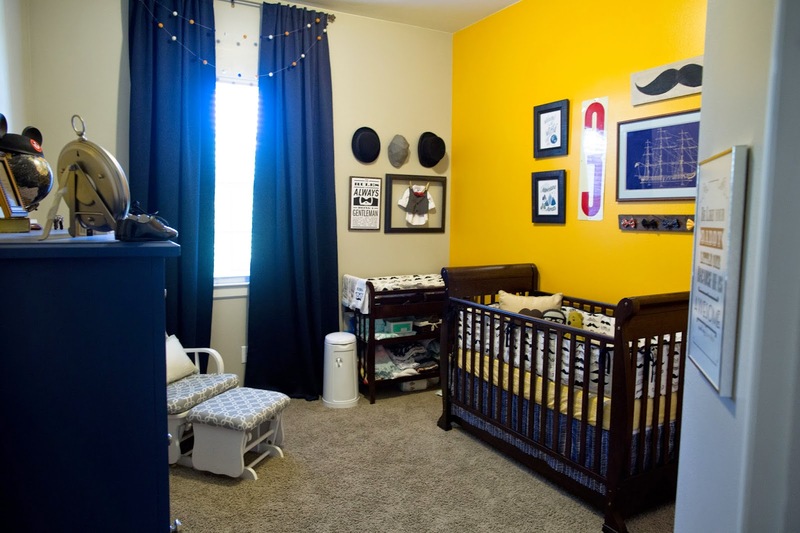 You've heard that old saying… "It takes a village to decorate a nursery" right? Ok, I made that up but I was so blessed to have my sweet family and friends help me create a personal space just for our new little McCarty. 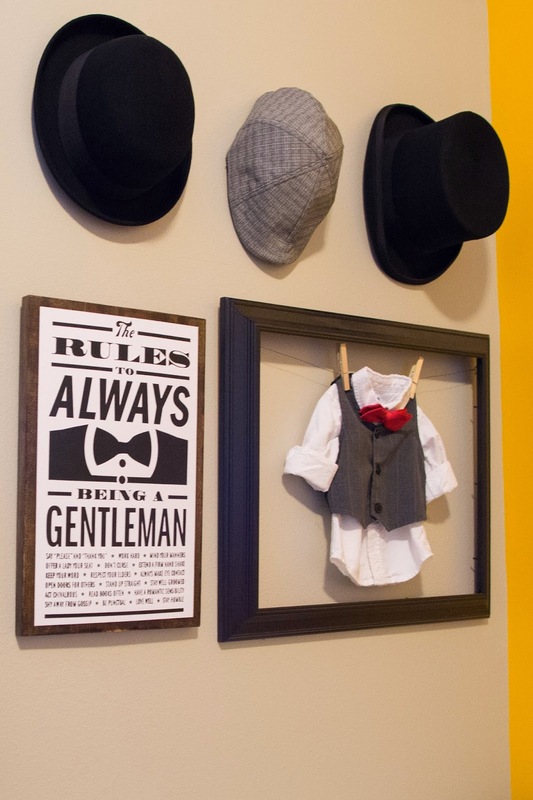 They were able to take my odd Pinterest board, sketches and imagination and put it into a room made for a little gentleman. I've teased little pictures of it here and there on my instagram and Facebook but why keep you in suspense any longer? It's just rude… so come on in! 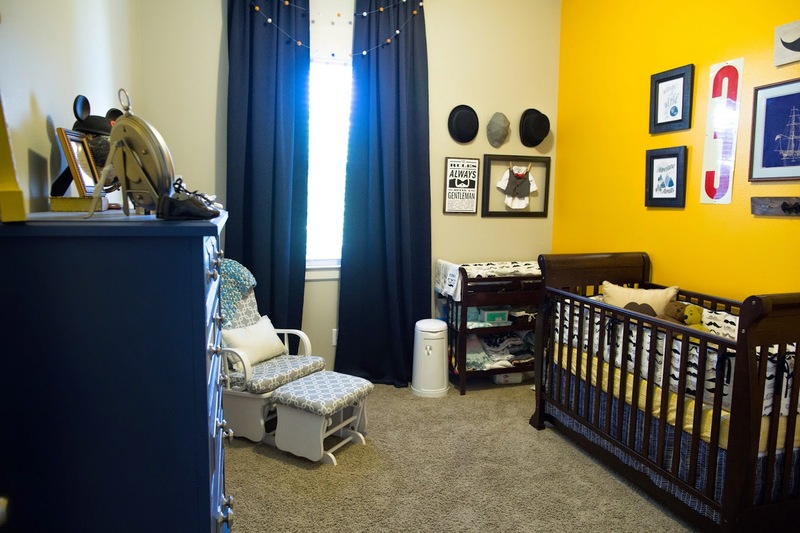 I started planning little Ezra's nursery the second the last guest left from our Gender Reveal Party. "You want to do what?! Why…" until it all came together. 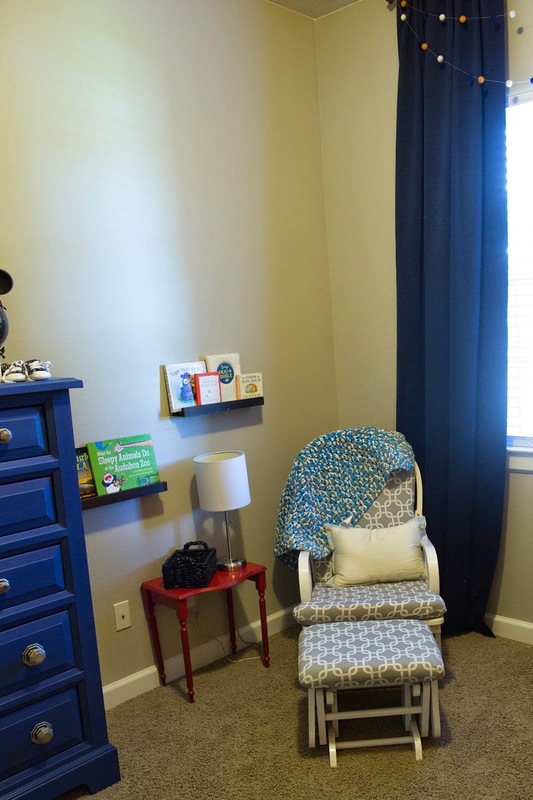 Three of the walls are my favorite paint color: Revere Pewter from Benjamin Moore. It's our nod to our Texas Born babe. My bestie Dannette recovered that glider for Ethan's room in 2012. The curtains are from the ever awesome Ikea and I did not a thing to them except let my hubs hang them and drape a felt ball garland over the top. 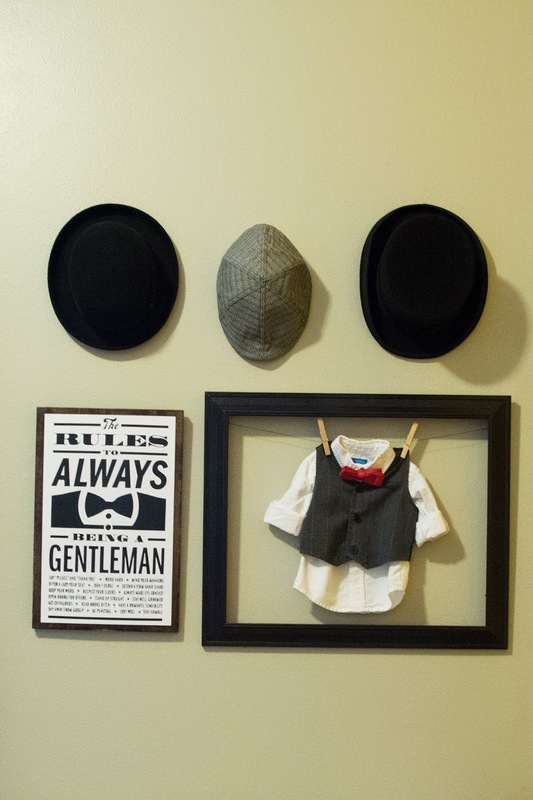 Above the changing table are some things every true gentleman needs: Hats, a set of rules and a dashing outfit. I got the bowler hat and the top hat from Ebay in my husband's size so we could use them for any of our costume parties. The middle hat we bought in New York after watching one of my favorite Broadway Plays The Newsies. The Rules to Always Being a Gentleman was taken from the internet. I had it printed on heavy duty card stock at Office Max and then I mod podged it onto a piece of wood I stained in dark walnut. It was tricky and the fourth time was the charm. I was going to get some metal baskets to hang some books but never found what I was looking for so I turned to my trusty favorite medium: wood. I whipped up those boys by myself in about half an hour. My favorite books in the room aren't in this photo sadly. They are Goodnight NOLA and What the Sleepy Animals do at the Audubon Zoo. Fantastic and beautiful books that I can't read aloud without adopting a Southern twang. 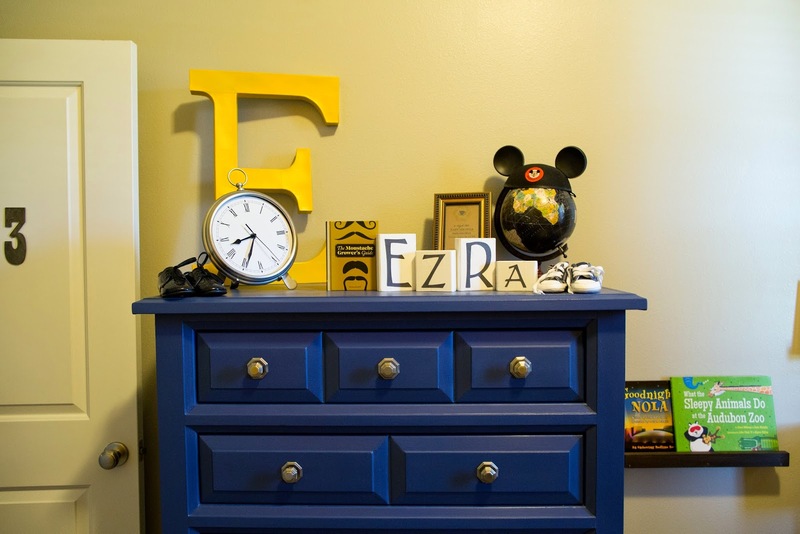 Recognize that dresser? I got it off craigslist in 2010 and it was a beautiful cream. I kept it cream through both of the other boys in case one day I'd have a girl… no girl so that puppy went blue! It was my first attempt at chalk paint and I failed miserably the first time. I mean like epic I cried for hours fail. I pulled myself together and re-did the chalk paint recipe and VIOLA! Stunning. 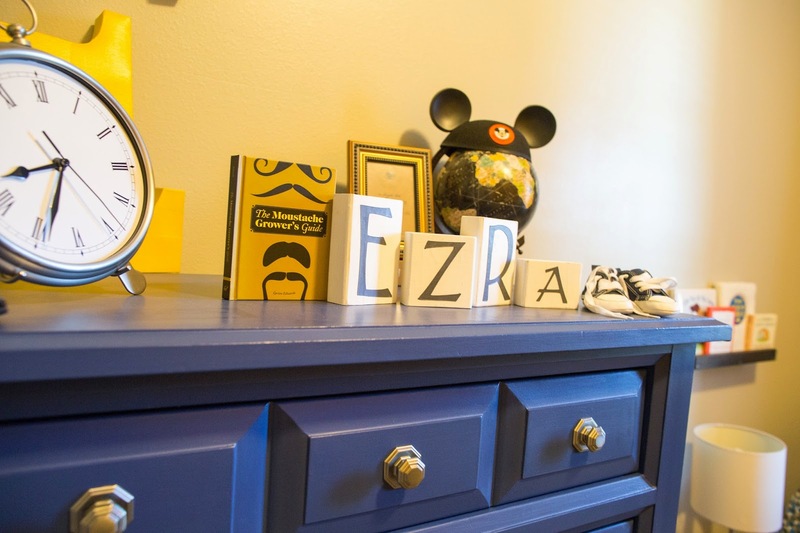 My friend Claire helped me make Ezra's name blocks and behind them is the beautiful invitation to Ezra's Baby Shower. Yet, this wall is probably the best in the entire room. The bedding was all hand made by my sweet and uber amazing friend Marci Lane. It's my favorite bedding ever. 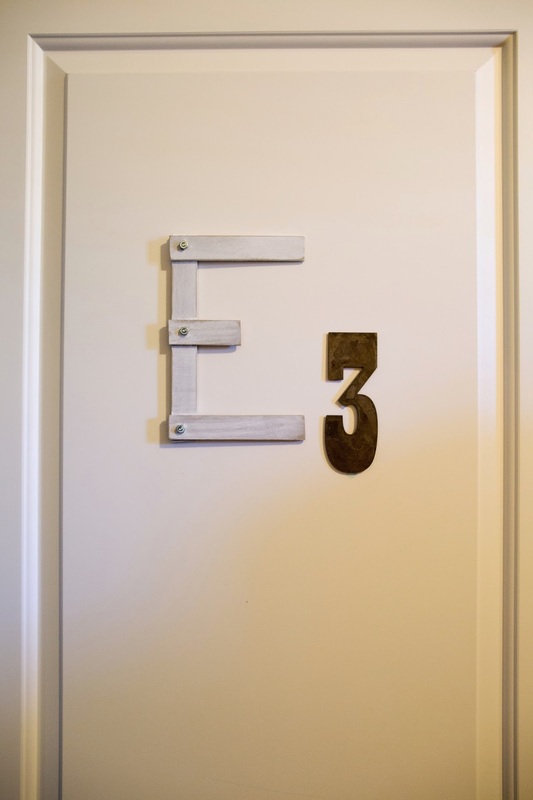 The number 3 is a vintage gas station number sign I found on Ebay. The ship photo belonged to Bryan and I bet he was crazy excited that I pulled it out of it's box it has been trapped in for the last four years. The mustache sign was made by my amazing friend Sarah! So Sweet!! Below is my bow tie rack. Dannette, Bryan and I had many versions of this wall on my living room floor until we came up with just the right combination. Another element I love in the room is something I designed myself. While raising three boys to be excellent Godly young men is hugely daunting and overwhelming… I take comfort in the fact that they have a wonderful example to follow in my husband. I pray that my little men grow up to be like their daddy. To lead their family with humility and love and to love their wife without judgement and unconditionally. So, I made this and hope it serves as a reminder what a real man is. Hope you enjoyed the little tour! 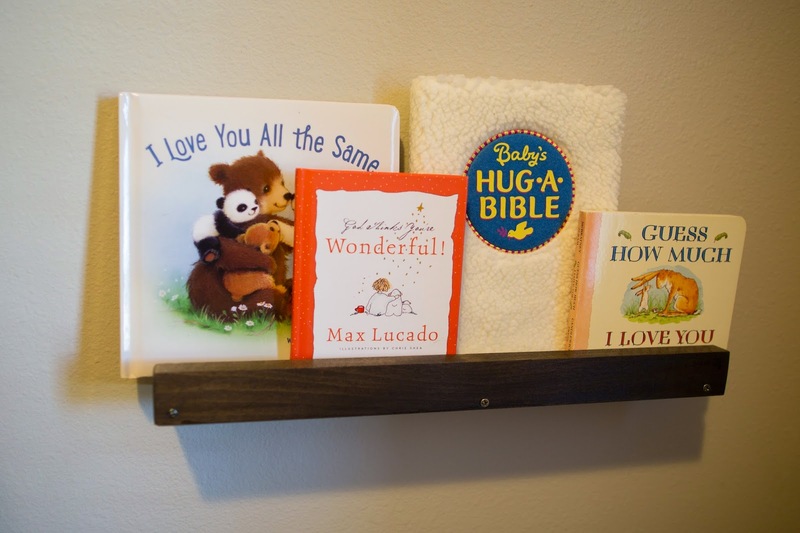 I hope our new little man will enjoy it as much as we enjoyed pouring love and work into it. 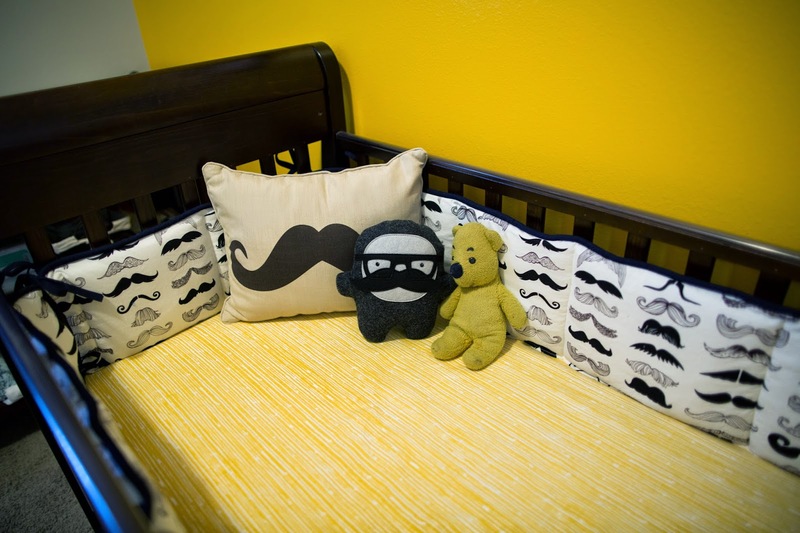 A special thanks to Angela Sostarch Photography for snapping these photos for us. 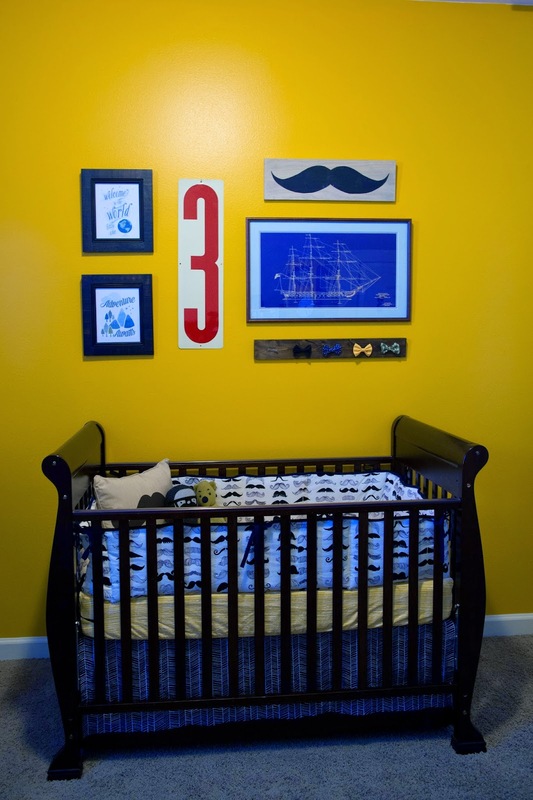 What a cute nursery for a little boy! 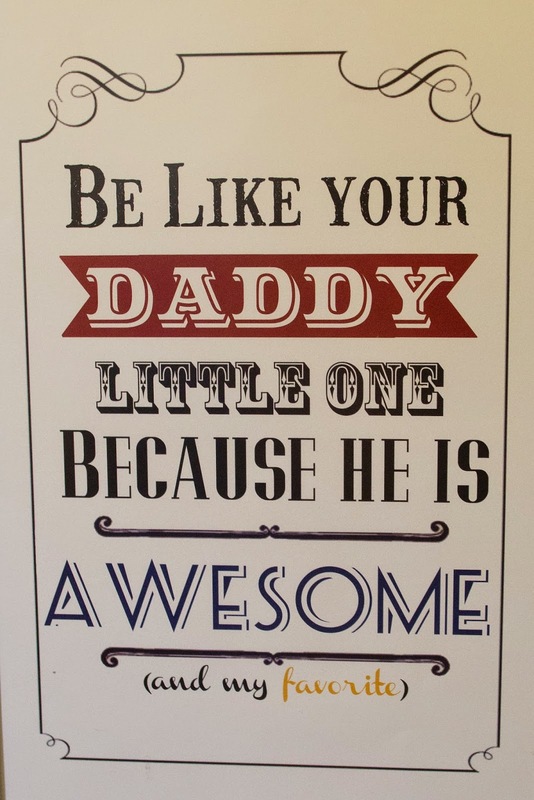 I love the sign about looking up to their Daddy! !